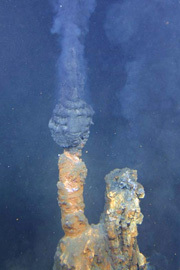 A "black smoker" chimney on the Brothers seamount on the Kermadec Ridge, emitting a hydrothermal plume of mineral rich fluid. See TerraNature letter to Prime Minister Helen Clark on Kermadec Ridge mining and ocean policy issues. Write to Prime Minister Helen Clark ... express your opinion on ocean management. The Australian mining company Neptune Resources Ltd has submitted applications to the Crown Minerals Division of the Ministry of Economic Development for two additional prospecting licences covering an area of 90,000 sq km. The area is further northeast from the location of the prospecting licence issued to the company in 2002 covering an area of 33,000 sq km on the southern Kermadec Ridge. The company says that rock samples from the seabed usually had a higher metal content than deposits on land. Initial prospecting discovered high levels of metals at the Brothers seamount volcano on the Kermadec Ridge at a depth of 1850m below sea level. The National Institute of Water and Atmospheric Research (NIWA) has conducted surveys of the seafloor, and Geological and Nuclear Sciences (GNS) has been sampling various seamounts from a series of submersible dives. Surface mining of the deep seabed will be blind, and damage caused by it will be indiscriminate, catastrophic and long-term. This type of mining will alter geochemistry and potentially cause the extinction of unique microbial flora. There is a need to protect flora and fauna of the seabed because so much of it is unknown. The real environmental impact of deep seabed mining will never be known, because a value cannot be placed on species that have not yet been discovered, and ecosystems that are undefined, that will inevitably be damaged or possibly destroyed. New Zealand is proceeding blindly into the first deepsea mining in the world, with unproven extraction methods, and consequently an unknown return from operations, and undefined gain that is likely to permanently affect and destroy natural resources. The seafloor being prospected by Neptune Resources (shaded area above) covers an area of 33,160 sq km (3,316,000 ha). The area starts 70 km off the Bay of Plenty coast, about 20 km north of White Island, and extends 423 km to the northeast along the Kermadec Ridge and Havre Trough. 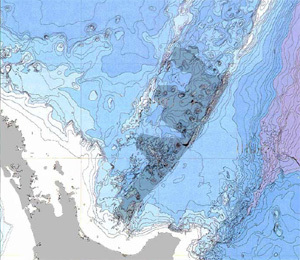 The granting of rights over 123,000 sq.km of Kermadec Ridge seabed, which is the equivalent of 46 percent of the land area of New Zealand, and is 3 percent of the EEZ, would be the largest mineral prospecting area under New Zealand sovereignty provided to one company. Neptune's prospecting licence contains no reference to any law or regulation that addresses prevention, reduction, control or monitoring of marine environmental pollution from mining operations. Neptune Resources describes the deposits of "seafloor massive sulphide" as a new asset mining class which has not been commercially developed anywhere else in the world. This raises the question of how the minerals will be effectively and equitably extracted, in the first operation of its kind. Deep seabed mining has been considered for overseas locations, but has been determined to be economically unfeasible.